Dentures can help replace some of the teeth or all of the teeth in a jaw. A root canal is typically required when the nerve inside a tooth is dead or dying. Wisdom teeth may come in misaligned or impacted, which may require oral surgery. Regular check-ups with your hygienist will help your teeth and gums remain healthy. White fillings can transform your teeth by getting rid of ugly black fillings. Orthodontic treatment is a way of straightening or moving teeth, to improve the appearance of the teeth and how they work. Dental CT Scans use advanced computer programs to analyse an X-ray study. Have you got what it takes to work at Ireland's National Dental Implant Centre? With dental implants you can say goodbye to dentures forever. Exclusive to Seapoint Clinic, the Click-tite™ system gives you secure dentures. We can provide fully fixed teeth in a day with just a single visit for almost anyone. We put your comfort at the heart of all the services we provide. Full Mouth dental implants can be made to look as natural as your own teeth. With no age limit, dental implants can be suitable for just about everyone. One of the largest dental implants FAQ sections available online. We're here to worry about your dental problems so you can get on with your life. At Seapoint Clinic, you will find the highest standards of dental care under one roof. As Ireland’s largest cosmetic and implant centre, we regularly feature in the media. High-tech and fully equipped on-site dental laboratory. Seapoint Clinic has been designed to give you the best possible dental experience. At Seapoint, we provide clear and transparent pricing. You deserve the best dental experience with total comfort and complete peace of mind. Our FAQ section will help find a wide range of answers for all types of questions. Do you wish you could completely transform your faded smile? It’s now possible to straighten your teeth without anyone knowing it. You can now have straight, beautiful teeth faster than ever before! In-clinic Teeth Whitening is the fastest way to get your teeth as white as possible. You deserve the perfect smile on your perfect day, so why not treat yourself? Transform your smile in just one visit with Instant Veneers. See what your smile could really look like, thanks to Digital Smile Design. Click here to be in with a chance of winning our €20,000 Smile Makeover! Dental CT Scans use advanced computer programs to analyse an X-ray study. 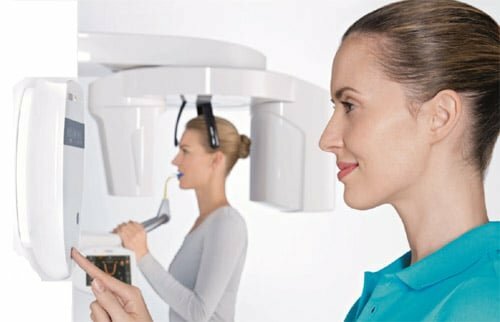 By providing detailed two-dimensional and three-dimensional images, Dental CT Scans enable your dentist to select the best location for your implants and plan the details of your surgery with pinpoint accuracy, well before the operation. How does a Dental CT Scan differ from conventional X-rays? Routine dental x-rays are two-dimensional; they only show the location of your teeth and the height of the bone. These x-rays are often distorted, and they cannot depict the thickness of your jawbone. They do not give accurate measurements of nerves and other important structures. A Dental CT Scan, on the other hand, is distortion free. It illustrates the actual make-up of the bone and provides three-dimensional and cross-sectional views of your jaws. The life-sized images allow your dentist to accurately measure the amount of bone that is available for implants. Why do I need a specialised scan? Dental CT Scans help your dentist determine whether you are a good candidate for implant surgery. This can save you from an unnecessary operation. Because the study tells your dentist a lot more than conventional x-rays, it helps him or her better prepare for your surgery. A Dental CT Scan means your dentist will know the exact location of anatomical structures, the contours of the jaw bone, and the best sites for your implants before surgery. This means that there are virtually no surprises when your dentist performs your surgery. That means less operating time, and fewer complications for you. By getting this X-ray for you, your dentist is providing you with the very best possible care. What will happen during the CT scan? You do not need to prepare for the CT scan. You may be asked to remove any jewellery from your head and neck, so that it does not interfere with the study. Once in the examination room, all that you have to do is to rest face up on the CT scanner bed. Your head will be comfortably cushioned on a padded cradle, and you will need to stay still. The radiographer will explain each stage before it happens. You will not feel anything and the only part of your body under the scanner will be your head. In less than 15 minutes you will be finished. After the scan the images will be saved and processed to produce 3D images of the area. these will then be studied by your dentist to determine the most appropriate treatment plan. What about the radiation aspects? Our XG3D scanner provides a much lower dose than a hospital based scanner and it alters the dose necessary depending on your individual anatomy. The radiation dose received varies from patient to patient but is typically in the range of 0.1 to 0.5 mSv. To put this in perspective, everyone in Ireland receives about 2.2 mSv annually from natural background radiation, so a Dental Scan corresponds to less than an additional 3 months of natural background radiation. We have our own dedicated in house CT scanner so you do not need to go anywhere else to get the CT scan done. Our dedicated team are waiting to hear from you today. Our expert team of dentists have compiled a Dental Implants book, which can help guide you through the dental implant process and answer any questions you may have. Exclusive to Seapoint Clinic and normally retailing at €30, you can receive your copy FREE by entering your details below.